The Supper Club will be our recreation of a historic event here at The Golden Ball. "SUPPER – On Monday evening last, a supper was given to a large party of friends and neighbours by Mr John Wilkins, of The Golden Ball, Longton. The Longton band attended, and, with untiring zeal, kept up a flow of good humour and pleasing enjoyment, by their lively strains during the whole evening. The same liberality was displayed by Mr Taylor, of the Bull Inn, on the same evening." A special day deserves a special menu and that is exactly what we have for you here. There will be 2 sittings. Pre-booking only. To book call 01772 613 527. Technically CNY is Tuesday 5th Feb but we want to throw a proper party so we are bringing you CNY early and no Chinese New Year would be complete without a Chinese inspired menu and… Karaoke! Join us for the foodie event of the year! Arrival for 7pm for the blessing of the haggis followed by a 3 course Scottish inspired meal for just £20 plus live music. Pre bookings only. To book call 01772 613 527 or pop in and speak to a member of the team. Tickets can be purchased from the bar. This is a ticket only event. This year we will also be offering food on Christmas Day. Our monthly dog walking morning is back for our Christmas dog walk on Sunday 16th December. While it is a Christmas walk please feel free to dress your dog (and you too) up. There will be a prize for best dressed dog. Starting at the pub at 10am we will go on an easy 5 mile (ish) circular walk back to the pub, with winter here we would advise you wear wellies or other suitable footwear, be aware there may be stiles we need to go over. Everyone welcome, with or without a pooch. 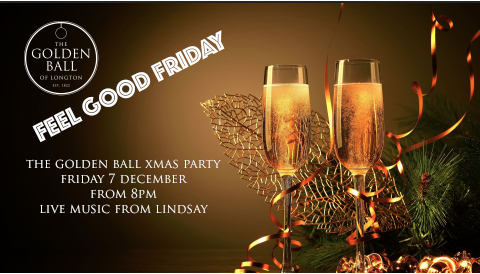 This months feel good friday will also be our Golden Ball Christmas party, a night to celebrate with everyone! All welcome, free entry. Singing from Lindsay from 8pm onwards. Sunday 2nd December 10am - 12 noon. Learn to paint starting with dots and working your way up to flowers, mandalas and much more. On this workshop choose to paint baubles, coasters or hearts perfect to keep or great for Christmas presents too! Places are limited to 15 people, secure your place by emailing info@golden-ball.co.uk and we will confirm you are on the guest list. No pre payment needed. Join us for our wreath making workshop. Sunday 18th November 10am - 12 noon. Perfect in time for Christmas, receive all the elements to make your own wreath with the helping hands of Jackie from Vintage Crafts with Jax. Places are limited to 8 people, secure your place by emailing info@golden-ball.co.uk and we will confirm you are on the guest list. No pre payment needed. 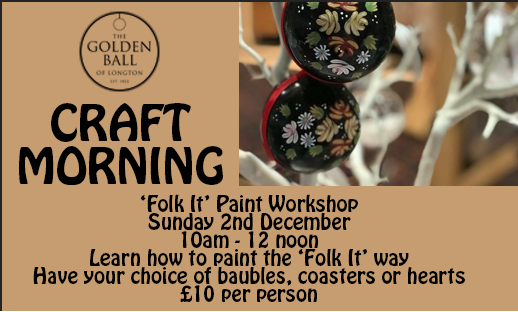 Join us for our first craft morning at The Golden Ball. Sunday 4th November 10am - 12 noon. Learn how to paint on leather with Donna Flowers from Where The Flowers Grow. Donna will make each of you a leather purse so after practising you will be able to hand paint your own purse and take it home with you. Perfect to keep or for a Christmas present! Places are limited, secure your place by emailing info@golden-ball.co.uk and we will confirm you are on the guest list. No pre payment needed. Our monthly dog walking morning is back on Sunday 4th November. Starting at the pub at 10am we will go on an easy 5 mile (ish) circular walk back to the pub, with autumn here we would advise you wear wellies or other suitable footwear, be aware there may be stiles we need to go over. Everyone welcome, with or without a pooch. We are changing our Feel Good Friday to a Freaky Friday this month for the day of the dead celebrations . With Lindsay singing live from 8pm. Feel free to get dressed up and fully embrace the day of the dead. The garden room will be set up for a kids cinema night we will be showing a spooky kids film with free popcorn and hot dogs for the kids to enjoy. Thursday 25th October. Arrival for 5pm. Our dog walking morning is back, we will start with a brew at The Golden Ball then go on an easy 5 mile circular walk around Longton and back to the pub. All welcome. 3-9th September 2018 - 50% off food* All you need to do is pre book your table. Then it is party time on Friday 7th September - Join us from 7pm for a FREE hog roast and live music and a real celebration. *Terms: 50% off main menu food only, not in conjunction with any other offer, must pre book online of over the phone, tables up to 6 people. 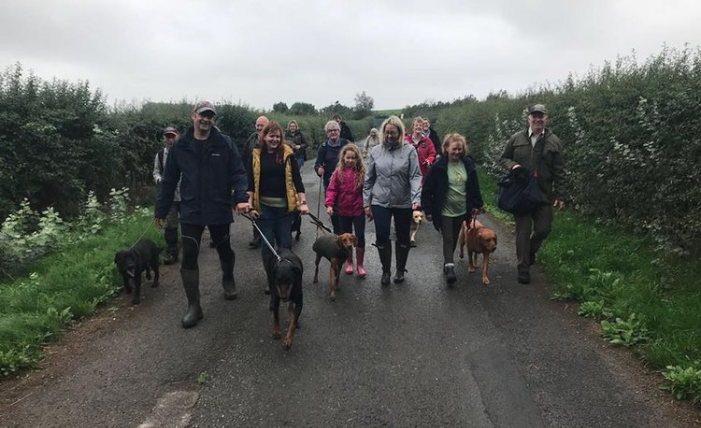 Our dog walking morning was open to anyone who wanted to bring along their pooch and even to people that might not have dogs but just love being around them! We started at 10am meeting at The Golden Ball and then off we went on an easy circular walk back to the pub we were joined by a wonderful group of people and pooches and can't wait for the next one. To find out more about the full event check out the Longton Live facebook page. With live music over 2 nights we had a great time, here is a video of our highlights. Enjoy a night of premium gin... this will include 5 of our premium gins, 4 with tonics and ending with a gin cocktail... this will be an interactive night and you will be able to help make your own drinks. Not only this, the night includes an antipasto board per person too. All for just £30 per person. Join us for our Bank Holiday weekend celebrations, on the Sunday we are going all out with a BBQ (outside if the sun comes to join us) plus live acoustic music from Mark Coyle 4-7pm and Tony Hassell from 8.30pm until late. Celebrating the marriage of Harry & Meghan the best way we know how - with a party for the whole village. Watch the Royal wedding on our big screen then enjoy: BBQ, gin & prosecco bars, live music, 1940s DJ & dancing, kids bouncy castle & face painting, ice cream van and much more. We will also be screening the FA cup final too. Come along from 11.30am and join in the fun. Everyone welcome. Join us for our Bank Holiday weekend celebrations, on the Sunday we are going all out with a BBQ (outside if the sun comes to join us) plus live acoustic music from Ian Bailey 4-7pm and Andi Bennett from 8.30pm until late. We are not celebrating Saint George's day for 1 day... we are celebrating for 3! Saturday 21st April will include English inspired specials on the menu. Join us for Live music from Andi Bennett and Irish specials from 5pm. Plus Charity Auction in aid of Derian House Childrens Hospice. We have a real treat lined up for Gin lovers. Jon Hopkins (National Sales Director) of Warner Edwards will be giving a tutored tasting including how gin is made, the history of gin along with 6 different Warner Edwards gin and tonics try during the evening. Arrival from 7pm. £20 per person. Food is not included in the event but please feel free to book a table to dine before or after the tasting. Celebrate with your loved one here at The Golden Ball, we are rustling up a very special set menu for you including a glass of fizz on arrival. All for just £30 per person. Join us for a real foodie event and celebration. We have a special Scottish inspired set menu from 5pm for just £15 (a la carte also available) plus whiskey cocktails as well as a real life ceilidh! Kittyhawk Ceilidh band will play from 7.30pm and that is not all! There will also be dancing from 8.30pm. 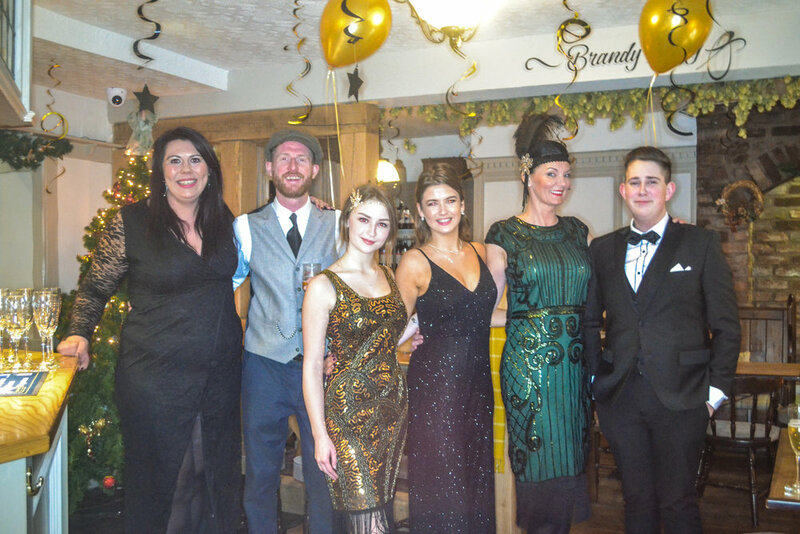 A great night bringing in the New Year, thank you to everyone who came to enjoy the fun. For the full photo gallery please click here.